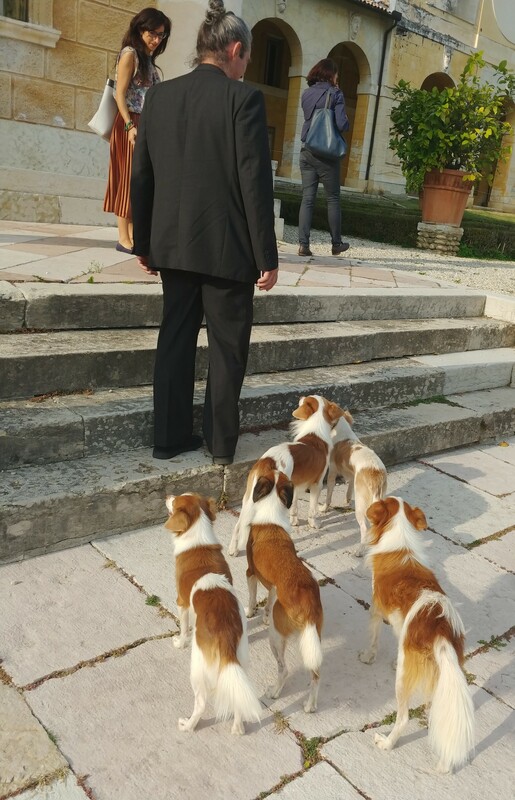 I felt like I was following the pied piper walking up a country road in the region of Veneto in Italy as one spaniel dog after another appeared to faithfully trail after their master. Then, before I knew it, the dirt road opened up to a magnificent estate with a villa that was reminiscent of the White House back home in the USA, except it was more extraordinary in its artistic expressions. 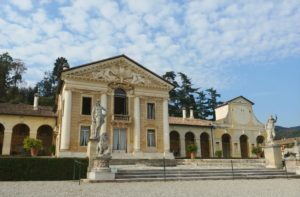 The legendary Venetian architect Andrea Palladio designed this villa in the 1500s and he has inspired building designs around the world with his creations. 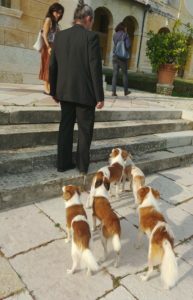 The leader of our band of spaniels was Count Vittorio dalle Ore, and despite being a very soft-spoken man with a quiet demeanor, his presence had a powerful effect on the pack of dogs that followed him everywhere. 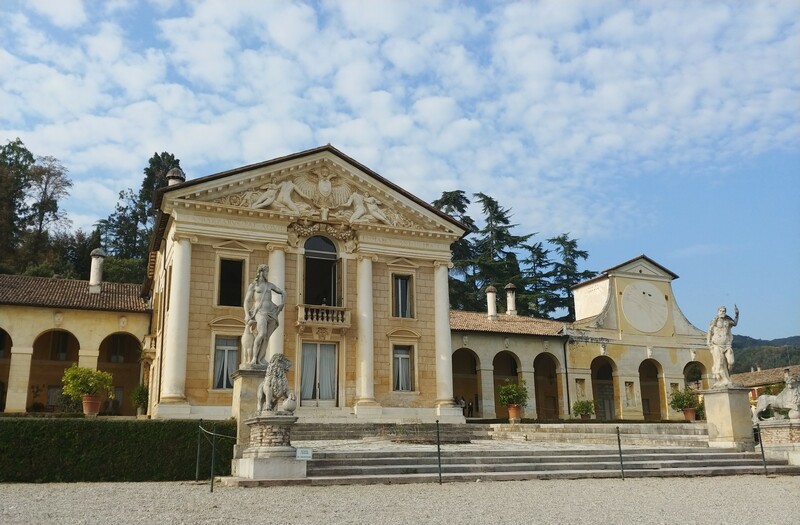 We were visiting the Villa di Maser (also known as Villa Barbaro) in the Asolo comune (Italian for township) within the region of Veneto to explore the “other” top quality Prosecco DOCG area that is much lesser known than the famous Conegliano Valdobbiadene. 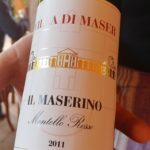 We had just tasted their “Il Maserino” Montello Rosso DOCG, which is a red wine coming from the Montello zone of Asolo, and since Asolo has varying degrees of factors that influence its topography and micro-climates, some zones can actually produce top level DOCG reds as well. Vittorio (Count Vittorio dalle Ore introduced himself simply by his first name) knew that we had been drinking sparkling Asolo DOCG Prosecco for most of the day, and therefore he made sure that we were supplied with a bottle of his top red during lunch, so we would have something to drink with our richer dishes. 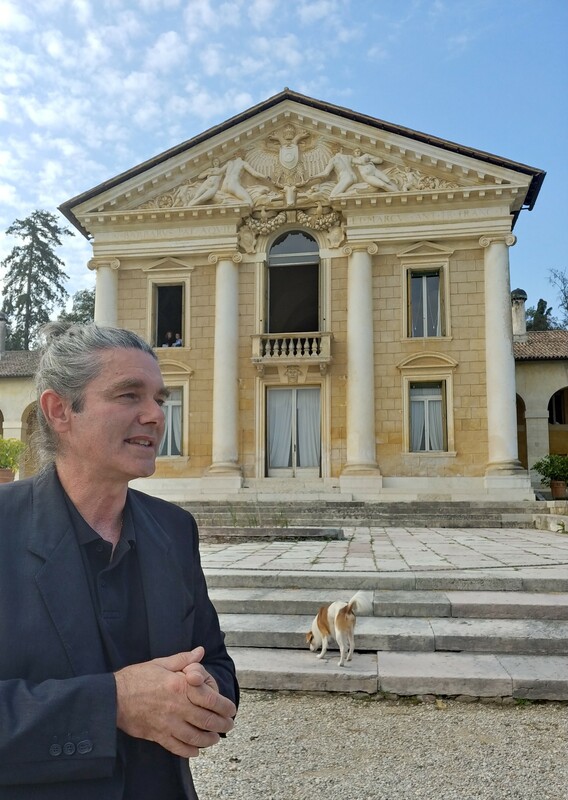 Vittorio helps to pay for the upkeep of Villa di Maser, a UNESCO World Heritage Site, by making wine from the vineyards that came with the estate purchased by his wife’s family back in the 1930s. One of the many things I kept hearing over and over from the Asolo locals was their strong desire to preserve the history of the past, many times taking the form of rebuilding what was destroyed in WWI, and working hard towards the progress of the future for a good economy for all. Montelvini was one of the Asolo Prosecco producers that I was already familiar with, although I didn’t know that their roots were specifically in Asolo. Like any other inhabitants living in a major wine loving city around the world, New Yorkers try to go deeper to find the best examples of styles that are popular. 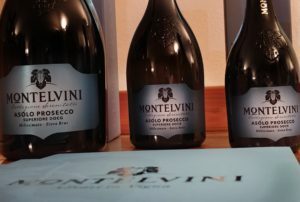 Since Prosecco has become a big trend with it deliciously floral and juicy fruit flavors that tickle the palate with gentle bubbles, many in NYC want to find higher quality versions as Prosecco can range from being ‘drinking on the porch wines’ to those sparklers that intrigue and delight with complex yet generous qualities, and consequently, I was originally introduced to Montelvini by a Prosecco loving wine nerd from Brooklyn. It was surprising to learn during my visit that the president of the Asolo wine producers group (Consorzio Vini Asolo Montello) was also the president of the Montelvini winery. During a couple of our morning tastings that displayed wines made by an array of Asolo winemakers that he led, there was no indication of which one was his wine. 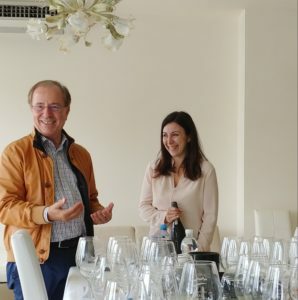 Armando Serena, president of Montelvini, with his son and daughter helping him to run the business, made it clear that he would not note which wine was his during the tastings as he didn’t want any favoritism. Armando kept to his intention of only discussing the factors and qualities that made Asolo a noteworthy territory for Prosecco (intense aromatics, increase in structure and weight, and ability to age) while never referring specifically to his own wines. As Armando spoke passionately about the Asolo people and all that they have survived, especially the winemakers, it was not surprising to eventually learn that his family had been making wine for over 130 years since his passion is deeply rooted in his ancestry. The Montelvini winery was an ideal example of a company preserving some wine traditions such as making low-cost, easy drinking wine available for locals to fill up a glass jug at one of the spouts in their stores. This is balanced with Montelvini’s realization of Asolo’s great potential to make higher end Asolo Prosecco sparkling wines and Montello red wines. 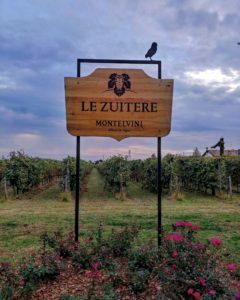 Furthermore, Montelvini is letting go of an outdated perception by making a commitment to reduce their carbon footprint by exporting wine in steel kegs. Despite their sparkling wine not being able to be labeled as Prosecco when sold in the kegs, this initiative has become very popular with younger drinkers, especially in places such as Brooklyn in NYC where young people want something fun, eco-friendly and quality driven. Another producer called Bedin also illustrated a lovely harmony between keeping true to their roots – this was illustrated by them honoring the first Asolo hillside vineyard purchased by their grandfather in 1948 by noting “Collina 48” on the label (collina meaning ‘hill’ in Italian). But Enrico Bedin, the grandson of the founder as well as owner with his brothers Luigi, Denis and Damiano, smiled when he brought out a playfully pink bottle after our tasting of their Asolo Prosecco wines. This festive looking wine was called “Il Lieve” (a reference to being aged on lees) because it was a non-disgorged sparkling wine from his family vineyards in the hills of Colli Asolani. Il Lieve is a wink to the traditional times when the second fermentation, which creates the bubbles, would happen in each individual bottle and then the lees (the deposits from the yeasts) are left for further enrichment. Enrico called it a funky wine that the youth in the area couldn’t get enough of… and I myself find these wines enticing with their fresh baked bread notes that, in this case, was balanced by juicy peach flavors and a dry palate with a mouth-watering finish. Before we met Vittorio, the owner of Villa di Maser, we were told that he was going through the mourning process of losing his wife a few months earlier. I could sense his deep sadness and struggle to have to talk to writers during such a trying time. I wondered if his noticeable grief was part of the reason his dogs were so vigilant about staying close to him. Then I noticed that he was still wearing his wedding ring and it made me think that it is not always clear when we should hold on and when we should let go. But the Asolo producers are constantly working to sustain such a balancing act for the harmony of their community that seamlessly expresses itself with the elegance of their wines. –Montelvini, “Il Brutto”, Col Fondo: 100% Glera. Low sugar (2 g/l residual sugar) so bone dry, unfiltered and a miniscule amount of sulfites in the wine since it has never been removed from its lees that resulted from second fermentation. A lower pressure (2.5 atmospheres – aka frizzante style) creates a sensation of creamy bubbles. Sweet stone fruit on the nose with toasted notes that became very mineral driven on the palate. **As of 2019, the term Col Fondo, meaning “with the bottom” (sediment or lees are present) will no longer be allowed on the label since one producer has trademarked it – “ui lieviti” meaning aged on lees (sur lie) will have to be used instead. 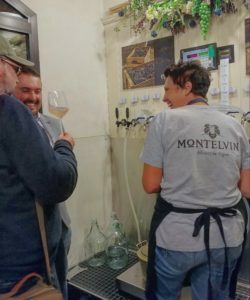 –Montelvini, Millesimato, Extra Brut: 100% Glera. Extra Brut indicates that it is on the drier side of Brut with only 5 g/l residual sugar. This Asolo Prosecco had a great salinity to it with the trademark full body and nectarine flavor that had a bright lime blossom finish. –Bedin, “Collina 48”, Brut: 85% Glera and 15% native varieties Perea and Boschera. The grapes are from their first 1948 vineyard in the Asolo area and this Brut has 10 g/l residual sugar which is still considered on the lower side for sparkling wine with evident acidity. Zingy citrus peel on the nose that was accompanied by white flowers with white peach skin. –Bedin, “Collina 48”, Millesimato, Dry: 85% Glera and 15% native varieties Bianchetta Trevigiana, Perera and Boschera. The grapes are from their first 1948 vineyard in the Asolo area. This Dry style was amazingly 22 g/l residual sugar and it is a real favorite with the local drinkers – it was delicious and pairs dangerously too well with cured meats and cheeses. Flavor of quince paste enriched the palate with an intense aroma of wild flowers lifting the finish. 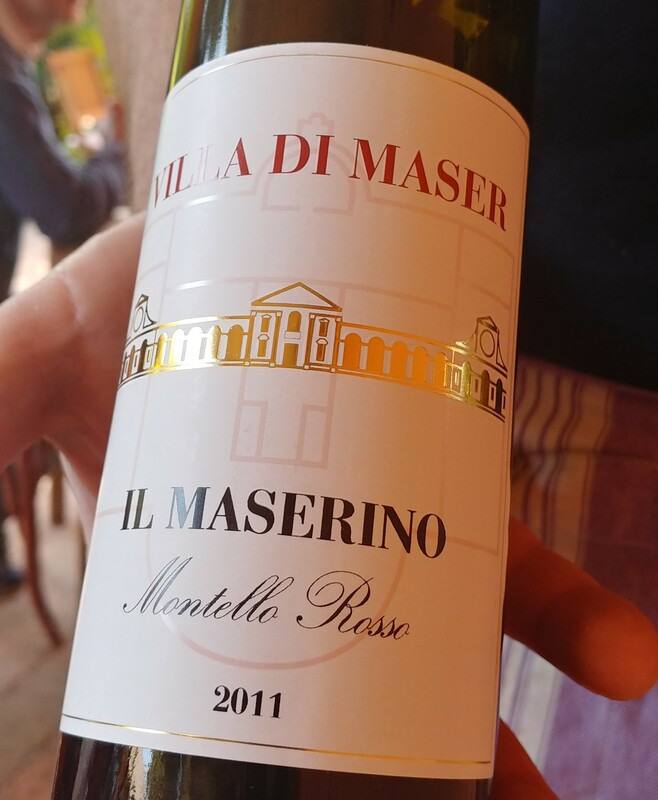 –2011 Villa di Maser, “Il Maserino”: Red blend of 60% Merlot, 35% Cabernet Sauvignon and 5% Cabernet Franc. The DOCG vineyard in Montello has a well-deserved reputation for Bordeaux blends such as this Il Maserino. This 2011 had a bright red currant heady aroma that had crumbly earth and pencil lead bring complexity in the background with a lean, energetic body. 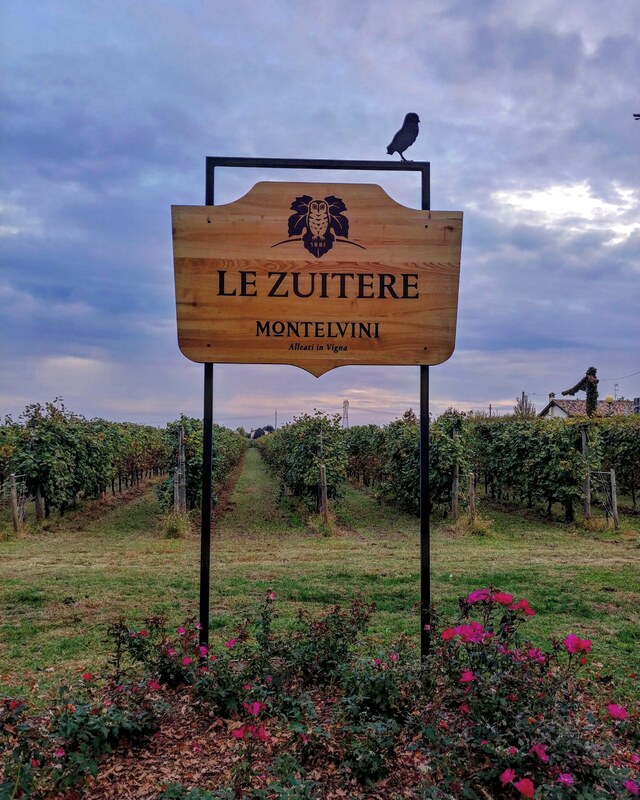 –2012 Montelvini, “Zuitèr”: Red blend of 60% Merlot, 20% Cabernet Sauvignon and 20% Cabernet Franc. Only made in the best years for Montello DOCG and so there was no 2014 and 2015 but the next vintages will be 2013 and 2016. Smoldering earth and fresh leather on the nose with restrained dark berried fruit and spice on the palate that had fine tannins creating a structure that was like intricate lace. 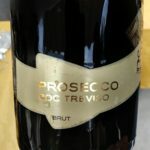 –Bedin, Prosecco DOC Treviso, Brut: 100% Glera and 10 g/l residual sugar. Very aromatic with flowers and orchard fruits that is lighter on the palate and more straightforward than the Asolo Prosecco wines. –Bedin, “Il Lieve”, Vino Frizzante:85% Glera and 15% native varieties Bianchetta Trevigiana, Boschera and Perera. Unfiltered with a miniscule amount of sulfites in this “Il Lieve” since it has never been removed from its lees (acting as a preservative) that resulted from second fermentation. A lower pressure (2.5 atmospheres – aka frizzante style) creates a sensation of creamy bubbles as discussed above. A bone-dry palate had an enticing note of freshly baked bread on the nose with peach cobbler and a stony minerality intermixed within the full body that had a fun grated ginger finish. 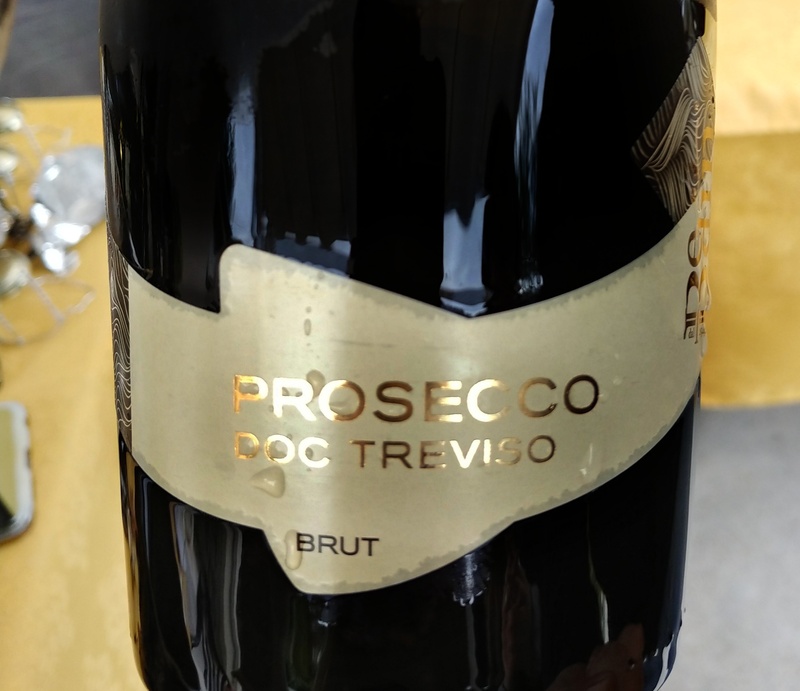 **Asolo Prosecco DOCG wines are shown in research to have a longer shelf life compared to many other Prosecco designated areas due to the higher amount of dry extract in the wines as well as give an impression of more weight in the body of these wines.